Filters. Every central heating and air conditioning system has them. Believe it or not, one of the most common causes for an HVAC service call is a dirty filter. And one of the most contentious. 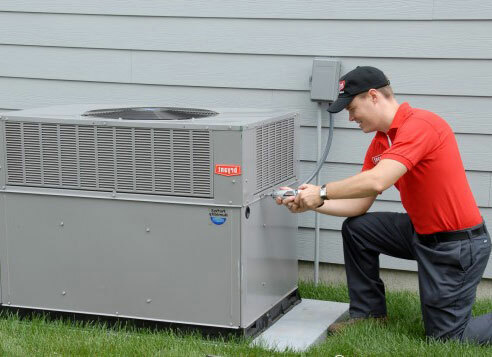 Homeowners are upset because even if they’re under either a manufacturer’s warranty or a service contract with their HVAC Company, most of the time they’re still billed for at least a “Trip” charge. The reason being that no warranty covers negligence, and forgetting to replace a dirty filter amounts to just that. The problem stems from the misguided assumption (fostered by hundreds of ads promoting indoor air quality, no doubt) that an air filter is provided in the system to keep the air inside the home clean. And, while some of the high end filters can do just that, it’s by no means the primary reason for the filter being there in the first place. High quality air cleaning and filtration goes well beyond the system requirements, and is recommended primarily for those with acute airborne allergies or asthma. For standard HVAC system installs, however, regular filters are installed first and foremost to protect the system, period. Dirty systems work inefficiently, and can even fail altogether, given enough restriction on the air flow. How Can A Dirty Filter Hurt the HVAC Equipment? The reason for this is simple. During the cooling season, warm air flowing through the air conditioning coil keeps the surface of the coil just above freezing, which allows the moisture that condensates on its surface to drain away. Slow the air flow down just enough with a dirty filter, and the surface temperature drops below freezing, the moisture turns to ice, and the coil “Freezes.” Once a coil begins to ice up, the process doesn’t stop, as the ice that forms slows the air flow even further, causing more and more ice to form. Eventually, no air can flow through the coil at all, and no more air conditioning. Interestingly enough, a dirty filter can cause icing on the outside compressor unit on a heat pump during the winter time, but the effect is still pretty much the same, except that now it’s no more heat. Fossil fuel furnaces, such as natural gas or propane powered models, contain what’s commonly referred to as a “Thermal Limit” switch. This is a temperature sensitive relay that’s mounted in the air stream of the furnace to protect the burner chamber from overheating. During the winter time, the air moving through the burner chamber draws the heat away, keeping the overall temperature below the thermal limit. But, if the filters get dirty, the air flow slows down, the temperature goes up, and eventually the thermal limit switch shuts off the flow of gas to the burner chamber to prevent overheating and damage to the system. Again, no more heat. The simplest way to avoid either of these situations is to regularly check and replace or clean the air filter or filters. For the best results, and the best energy efficiency, check the filter or filters on a regular basis. It’s fairly easy to see the difference between a clean filter and a dirty one. A simple way to remember to do so is to check them every time the power bill is paid. This way the homeowner can avoid higher energy costs or system malfunctions that could prove costly or embarrassing.